This powerful daily devotional will help Purpose Driven® Life readers and others move deeper into God's plan for their lives. 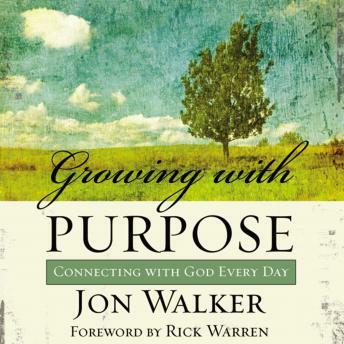 Author Jon Walker, who has worked as an editor and writer with Rick Warren for many years, challenges readers to return God's grace to its proper place, above sin, where love always triumphs over lists of rules, where no one is forgotten, and where everyone gets more than a second chance.Using a compelling, conversational combination of parable and humorous prose, these 366 devotionals will energize readers as they move toward a deeper, transparent relationship with God. It asks readers to make an authentic assessment of how their beliefs connect-or remain disconnected-with the decisions and actions they make each day.Appealing to a broad range of readers, Growing with Purpose is a fresh look at biblical truth that will transform the way men and women live their lives as believers. It's a gift that will be read over and over again, strengthening the spiritual legacy readers hope to build in those they love. You can learn more about author Jon Walker's ministry at www.HisGraceEmbraced.com.